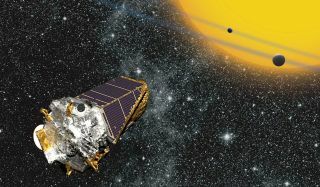 Artist's illustration of NASA's Kepler space telescope, which has discovered more than 2,650 exoplanets to date. Kepler has been roused from its latest slumber and begun another round of observations, NASA officials wrote on Sept. 5, 2018. The Kepler roller-coaster ride continues. NASA's low-on-fuel Kepler space telescope, which has discovered more than 2,650 alien planets to date, has awoken from yet another slumber and begun making science observations again, agency officials announced today (Sept. 5). That work came to an end in May 2013, after the second of Kepler's four orientation-maintaining reaction wheels failed and the spacecraft lost its superprecise pointing ability. Mission team members figured out a way to stabilize Kepler using sunlight pressure, however, and the instrument embarked on a new mission called K2 in 2014. During K2, Kepler studies a variety of cosmic objects and events over a series of 80-day "campaigns." Kepler got all the Campaign 18 data down successfully — and then went back to sleep, mission team members wrote in an Aug. 24 update. Which brings us to today's news. Kepler has woken up again, starting Campaign 19 of its K2 mission on Aug. 29. But it's still unclear what the future holds for the spacecraft, NASA officials announced. "After being roused from sleep mode, the spacecraft's configuration has been modified due to unusual behavior exhibited by one of the thrusters," they wrote in today's update. "Preliminary indications are that the telescope's pointing performance may be somewhat degraded. It remains unclear how much fuel remains; NASA continues to monitor the health and performance of the spacecraft." Kepler's current exoplanet tally stands at 2,652, with 325 of those discovered during K2. That total represents about 70 percent of all known alien worlds. And Kepler's finds will keep rolling in, even after the spacecraft has ceased operations (whenever that may be); more than 2,700 Kepler "candidate" planets still need to be vetted by follow-up observations or analysis.